A common problem when taking macro photos (really close up photos) is that the part that will be in focus will be very narrow. This the length of this area is called the Depth of Field (DOF). Focus rails can be used to extend the in macro photograpahy. The idea is to take a series of photos at different distances, so that area in focus will move along the subject, and afterwards these photos are joined together using special software. Professional focus rails are quite expensive. But it is easy to build one self, as it is actually a very simple device. The parts can be bought cheaply on Ebay. 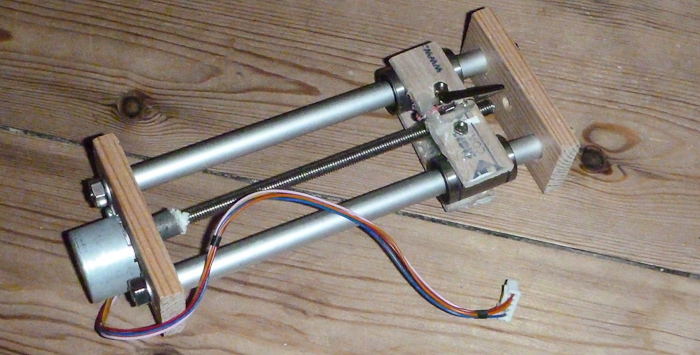 It uses a unipolar stepper motor to around 20 DKK. The rails are alminium tube, which may were over time at the contact points between it and the wagon. But there hasn't been any prolems with it yet. I've tried to use Helicon focus and Zerence Stacker. All in all I'm not a 100% pleased with the results. I'll have to investigate further possibilities. Someone told me, that the newest Photoshop versions have really good stacking support, but I'll have to try it first before believing it.